The drills began on Monday with troops practicing thwarting a Chinese "invasion." The similar incident occurred in last November, when a Mirage jet with a pilot on board mysteriously disappeared. Taiwan news media outlet reported, citing sources from the Ministry of National Defense, that some pieces of the crashed aircraft had been discovered in mountains of New Taipei city. However, the pilot remains missing. 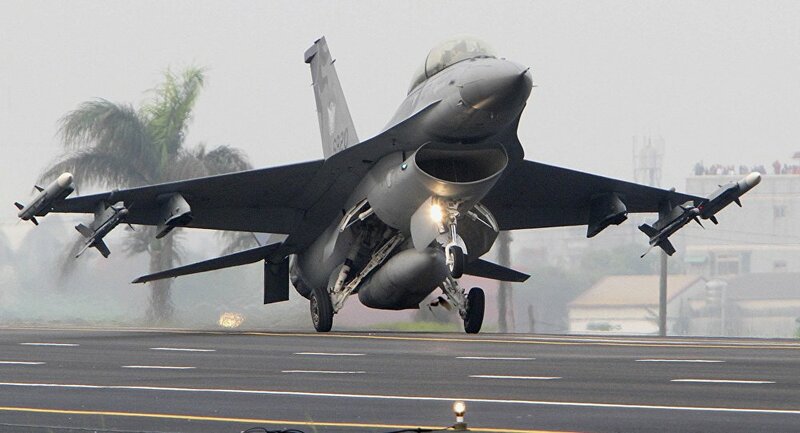 "One F-16 single-seat fighter went missing at 13:43 local time [05:43 GMT] while performing tasks set during the military exercises on Monday, a search and rescue operation has now been launched," the statement read, as quoted by Taiwan's Central News Agency (CNA). The Taiwan military added that it was making its best to search for the missing pilot, Major Wu Yen-ting. — AIRLIVE (@airlivenet) 4 июня 2018 г. The five-day Han Kuang military exercises, which are Taiwan's biggest annual drill, started on Monday. The main tasks of the exercises are to practice the joint operations at sea and on land and to boost anti-landing defense in the different parts of the island. Taiwan's defense ministry announced, that the main goal of the drill is to counter any possible Chinese military mission to the island.